It’s unlikely you’ve heard of Casas Viejas, a village in Andalusia. In fact, its name was changed to Benalup (de Sidonia) and later to Benalup-Casas Viejas. It’s a tragic story. But first, let’s clarify some necessary abbreviations and give you the background to the terrible events of January, 1933. CNT: Confederación Nacional del Trabajo. National Labour Confederation. Founded 1910. Anarcho-syndicalist trade union. FAI: Federación Anarquista Ibérica. Iberian Anarchist Federation. Founded 1927. More militant vanguard of the CNT. PSOE: Partido Socialista Obrero Español. Spanish Socialist Workers’ Party. Founded 1879. UGT: Unión General de Trabajadores, the PSOE’s trade union affiliate. Founded 1888. The Second Spanish Republic (1931-36) faced numerous challenges when it was proclaimed on April 14, 1931. The Republic’s first Cortes (Parliament), made up of a coalition majority of left wing politicians led by the socialist PSOE, proposed radical social and economic reforms. Opposed to the reforms were right-wing, historic and conservative powers such as the Church, landowners and the army, as well as bankers, industrial and commercial interests and millions of conservative Catholic churchgoers. On the other hand, the reforms were greeted enthusiastically by millions of landless peasants and factory workers, and by regional nationalists –especially Catalans– who sought some recognition for Catalonia. Predictably, as it pressed forward quickly with its reforms, the government found itself under attack. The Right resisted change employing a variety of tactics to frustrate the government (e. g. lock-outs, leaving land untilled, threatening to move money out of the country, refusing salary increases to workers). Opposition from the Right was to be expected, but from the beginning the Republic and the government that represented it also faced enormous problems from workers’ organisations, notably the anarcho-syndicalist union, the CNT, and its much more militant branch, the FAI. The situation was also aggravated by the bitter rivalry between the PSOE (and the UGT, its trade union affiliate), and the CNT. Where the PSOE sat in the Cortes, the CNT, being a union, held no parliamentary seats. Anarchist in spirit, the CNT did not endorse the Republic although its more moderate members were willing to give the Cortes a chance to fulfil its promises. Unfortunately, not so the FAI, whose goal was to oppose the socialist dominated government and bring about revolution even if that meant direct confrontation, illegal strikes and violence. Feuding between cenetistas and faístas split the CNT whose loose, decentralised organisation allowed the faístas, to gain control of the union, and purge it of its more moderate leadership. Which brings us to Casas Viejas, an obscure small town in the province of Cádiz (Andalusia). What happened in Casas Viejas became one of the defining moments in the history of the Second Republic. Huddled on the furthermost edge of the Serranía de Ronda mountain range and facing a fertile valley that stretches westward in the direction of Jerez and Seville, Casas Viejas was a poverty stricken, agricultural community with a population of about 2.000. The life of the inhabitants was fairly typical of the hardships experienced in those areas of Andalusia, dominated by the latifundistas (large estate owners). Most of the campesinos lived in primitive conditions, primarily in chozas: huts with earthen floors, a mixture of mud and bits of stone for walls, and a covering of branches or straw. The men worked in the surrounding latifundios as jornaleros i.e. they were hired by the day or for a specific task. This meant turning up at the village plaza (square) at dawn each day in the hope of being hired by the landowner –or more likely his foreman. It was a humiliating, slave-market ritual that re-enforced the hierarchical structure of local society. In this case, the most powerful landowner was the Marquis of Negron whose estate (made up of different parcels of land in the region) totalled over 10.000 hectares (almost 25.000 acres). Smaller amounts were held by the financially pressed Duke of Medina Sidonia. Like so many latifundistas, both Marquis and Duke were absentee landlords, the Marquis living in the bustling sherry capital, Jerez de la Frontera, and the Duke in Madrid, and were largely indifferent to the conditions of the campesinos. Exhilarated crowds invaded everything. There were continual shouts of ‘Hurrah for the Republic!’ Speakers spontaneously took strategic places and gave fiery speeches to the crowds that gathered around. They referred to the old monarchical regime with loathing phrases and insults… The names of the streets were changed to others associated with the new regime… There was nothing but jubilation and praise!… All the state organisms at the service of the humble classes! It seemed at first sight that everything had been transformed, that a social revolution had taken place as if by magic, and that capitalism had lost its enormous cruel and despotic power (quoted in Mintz 129). It wasn’t long, however, before the community felt the heavy hand of authority, but this time it came tragically from the very regime that it had greeted so enthusiastically. Still, the events that catapulted Casas Viejas into the public eye started not in the town itself but in the northeast of the country. Towards the end of 1932, the leaders of the FAI planned a revolutionary insurrection in Barcelona and other urban centres. Local uprisings in smaller communities would serve as a diversionary tactic to keep government reinforcements distracted as much as possible. Militant rhetoric in anarchist newspapers spread the revolutionary gospel against a socialist dictatorship. Workers were reminded that the instruments of production are invincible weapons. A sickle can be used for something other than to reap, and a hoe can serve to dig the grave for all that has outlived its time (Mintz 180). The call to arms came on January 8, 1933, but government forces reacted swiftly and efficiently. There was some furious fighting, several bombs went off and some people died, but the hoped-for mass proletariat attack on the “socialist dictatorship” never materialised, and within a few days the insurrection was over. Like the right-wing attempted military coup of August 1932 (known as the sanjurjada, after its leader, General José Sanjurjo) the anarchist insurrection of January 1933 had been ill conceived and poorly organised. Where does Casas Viejas fit into all this? Like so many communities in Andalusia with landless labourers, it had been attracted to anarchism’s messianic ideology of federated communes freed from the tyranny of institutional authority. Anarchism had penetrated western Andalusia as early as 1870 (Cádiz), especially the vineyards around Jerez and the agricultural town of Medina Sidonia, only some 20 kilometres from Casas Viejas. The first anarchist centre in Casa Viejas was set up in 1914 by a charcoal burner from Medina Sidonia, and by 1933 had a well established presence there. The confusion attending the insurrection of January 8 in the north east filtered down to Andalusia and to Casas Viejas. 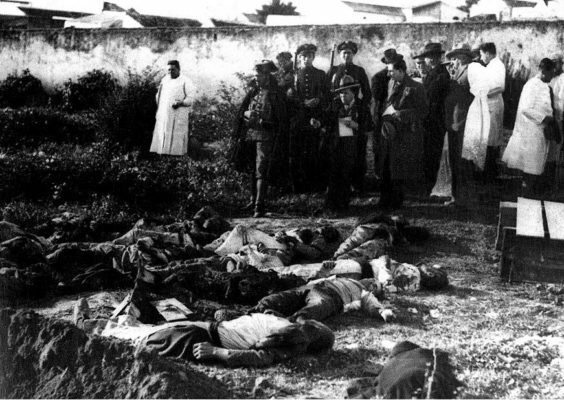 By the 10th, there were reports of uprisings in Jerez, Cádiz, Algeciras etc., but radio bulletins from Madrid announced that the movement had died. Unfortunately, in Casas Viejas the leaders interpreted these official releases as an attempt to trick them. Believing they were joining the revolution, they took over the town early on the morning of the 11th. They cut the telephone wires, dug ditches across the roads to prevent entry, raised the anarchist flag and declared the establishment of a comunismo libertario (libertarian as opposed to state-controlled communism). But there still remained within the town four members of the feared symbol of state authority: the Guardia Civil. Things went dreadfully wrong when two of the guardias were fatally wounded as the townsmen surrounded the barracks. 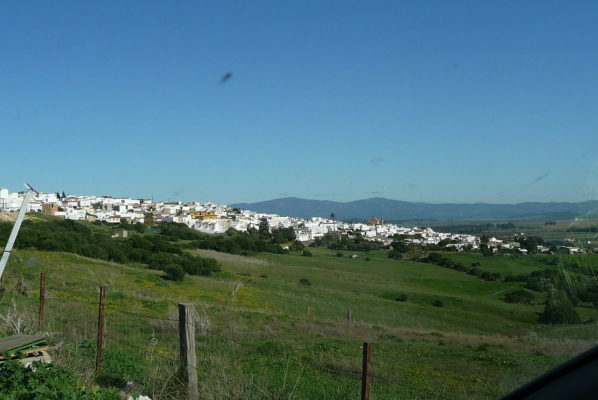 At about the same time, the telephone operator in Medina Sidonia noticed that contact with Casas Viejas had been cut, and a repairman and three guardias were sent to investigate. Just outside the town, where the wire had been cut, the guardias captured four men. With the line repaired, reinforcements were immediately requested and by about 2 p.m twelve more guardias had been rushed from a neighbouring town. Firing their rifles in the air as they entered, they succeeded in dispersing the insurrectionists, many of whom scattered into the nearby hills. A few were captured in their homes; one at least was severely beaten and revealed the identities of other participants. At about 5 p.m. the guardias were joined by a dozen Assault Guards and four more guardias, and the search for the escaped insurrectionists began. They concentrated in particular on the hut of a 70-year charcoal burner, nicknamed Seisdedos (Sixfingers), whose two sons-in-law had been clearly implicated in the siege of the Civil Guards’ barracks. The three were there together with other family members and a couple of friends (total of nine). What happened next became a gruesome incident that horrified the nation. It began when one of the Assault Guards was killed by a shotgun blast as he tried to enter the hut. Appeals to surrender were ignored, and the guards opened fire. However, by now it was getting dark and it was difficult for the guards to advance on the hut because it was awkwardly located in a hollow and the rebels inside were good shots. In addition, under cover of darkness, some other insurrectionists had resurfaced and tied down the guards by gunfire from surrounding rooftops. Around 10 p. m. some more guards arrived with hand grenades and a machine gun. The machine gun, however, failed to work, and the grenades didn’t explode! Finally, at about 2 a.m. a company of forty Assault Guards arrived led by Captain Manuel Rojas with strict orders to overcome opposition within fifteen minutes. Even with the repaired machine gun and added rifle fire peppering the hut, the forces of order failed to overcome the rebels. A telegram from the provincial governor demanded the hut be levelled. Within a few minutes Rojas ordered the choza to be torched, a measure that had earlier been rejected for fear of setting the whole town alight. Flaming cotton balls tossed on the roof ignited the thatch immediately. Only when the roof collapsed did the shooting stop. A young woman –Seisdedos’s granddaughter– and a child were allowed to escape, but all the others died, either from rifle fire or incineration. The details of what happened in the next few minutes are not clear, but the results were: twelve men lay dead. Later testimony from Rojas was contradictory. On the one hand, he wrapped himself in a patriotic flag, defending the Republic against widespread anarchy while arguing the killing was an emotional reaction to the pressure they had all been through. On the other hand, he claimed to be acting under orders not to take any prisoners, an accusation denied by the minister in charge of security. Victims in the Tragedy of Casas Viejas. Whether a calculated execution or an emotional response, the massacre of twelve helpless prisoners shocked the nation when it became public. At first the government defended the police claiming that they were fighting to maintain order. However, as details filtered out, and press reports gathered momentum, the government was soon on the defensive. The most sensational accusation was that Prime Minister Manuel Azaña himself had allegedly ordered “Neither prisoners nor wounded. Shoot them in the belly” (Mintz 247). Azaña indignantly denied the accusation, but it was to cling to him like a curse. A parliamentary investigation to look into the role of government members in the massacre concluded that there was no evidence to implicate any of them, although it did not contest the accuracy of what had happened. The grim events of Casas Viejas etched themselves indelibly in the history of the Second Republic, and in particular on the actions of Azaña’s ministry (which was soon known simply as “the government of Casas Viejas” (Mintz 251). The massacre became a political liability leading eventually to the downfall of the government in September of 1933, and to the subsequent election of the right-wing coalition that followed. In total twenty-two campesinos and three guards died in the confrontation, but what really stunned the country was the brutal punishment inflicted on a group of poverty stricken, insignificant, southern campesinos when compared to the more cautious approach adopted for the more powerful anarchist rebels of large urban centres. It was authoritarian overkill, and the stench of bullet ridden bodies –fanned by political opportunism—had serious consequences. In the aftermath of the massacre, both the Right and the Left sought political advantage to attack the government. The former saw further evidence of the government’s inability to maintain law and order, the latter depicted the villagers as heroically resisting against brutal authority. 1933 witnessed a cycle of disorder and repression as workers vented their frustration at the seeming lack of social and economic change. Indeed, over the year, strikes by the UGT and CNT reached a staggering number: 1,127, involving 843,000 strikers (Shubert 134). An already embattled left-wing coalition crumbled as the UGT found it more difficult to ignore the anger of its members, and PSOE members of the Cortes –disillusioned with their collaboration with Azaña’s republicans– seriously questioned the usefulness of the alliance. By early September loss of confidence in Azaña forced him to resign. Two brief attempts to form new governments failed, and a decision by the Socialists to refuse to join any coalition and to seek power on their own persuaded the president, Niceto Alcalá Zamora to dissolve the Cortes on October 10 and call new elections for November 1933.